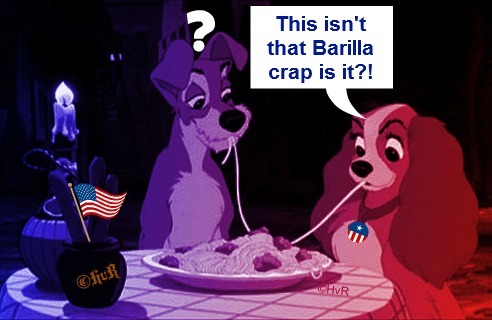 Photo of the day: BOYCOTT BARILLA PASTA ! That bigoted small minded comment has caused an backlash spreading fear in the company’s accounting department as sales started to drop. At a open minded dinner table no longer will Russian Vodka and Italian Barilla pasta be served. 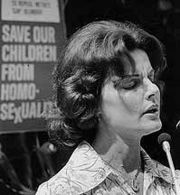 This takes me back to 1977 when the right wing Christian Florida orange juice queen Anita Bryant declared her war on gays. The campaign began an organized opposition to gay rights that spread across the nation. Jerry “I have sinned!” Falwell went to Miami to help her. Bryant made the following statements during the campaign: “As a mother, I know that homosexuals cannot biologically reproduce children; therefore, they must recruit our children” and “If gays are granted rights, next we’ll have to give rights to prostitutes and to people who sleep with St. Bernards and to nail biters.”She also added that “All America and all the world will hear what the people have said, and with God’s continued help we will prevail in our fight to repeal similar laws throughout the nation.” Well . . . Anita suffered a backlash like none that had been seen before. Her many commercial endorsements ceased one by one. TV show and concert appearances were canceled. She was heckled and booed wherever she went including having a pie thrown in her face. If you want to stop or hurt someone – you hit them in the pocketbook which is exactly what we did! Secretly sold at the time (1977) in head shops, were rings that had razor blades hidden in their design. So, in the days before store camera surveillance, you went to the orange juice section of the grocery store – and let your ring hand slide over allllll the orange juice cartons. No juice = no $ale. Stores terrified of further vandalism stopped carrying Florida orange juice. In the end, gays won. Anita suffered bankruptcy and divorce after divorce finally being reduced to selling religious sunglasses. Yes, you read that right, they had scripture on the inside stems. So Mr. Guido Barilla . . . I may not still have my razor blade ring, but – I will gladly poke my finger through the cellophane of all you pasta boxes in the local supermarkets. The tactic was very effective the first time. Ready everyone: POKE!